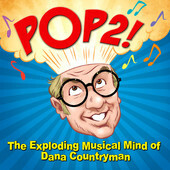 Dana Countryman’s Pop 2! : Sounds of the Seventies Come Alive in 2014! If I could turn back the hands of time to, say, the panoramic 1970s, and do it all again, I would take Dana Countryman with me. After a nutritious lunch consisting of peanut butter and jelly sandwiches (crusts intact), Ring Dings or Ding Dongs, and plenty of cherry and grape Hawaiian Punch, we would set out our portable record players and one-up each other with the happy, infectious sounds of the decade–the sounds that brought the catchy and peppy melodies to our ears. In the melody-charged seventies, AM radio blasted pure pop delights out to the masses–great songs like Edison Lighthouse’s “Love Grows (Where My Rosemary Goes)”; Vanity Fare’s “Hitchin’ a Ride”; the Partridge Family’s “I Think I Love You”; Lobo’s “Me and You and a Dog Named Boo”; Hamilton, Joe Frank and Reynolds’ “Don’t Pull Your Love”; and Gallery’s “Nice to be with You” populated powerhouse music radio stations from coast to coast. These were the days of melody and joyous, hook-filled tunes and they’re back, courtesy of the self-described “neat guy” Dana Countryman. 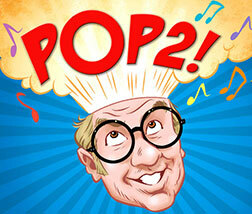 His new album, echoing the sounds of the melodic seventies, is called Pop 2!, and it’s a pure pop delight. 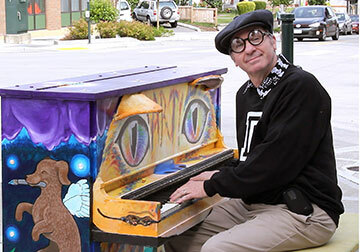 Some day, someone’s going to write a book about this colorful, larger-than-life, state of Washington-based musical mastermind, who, among other things, was in the eighties a member of the popular musical comedy group, the Amazing Pink Things, but until then all you need to know is that Pop 2! The Exploding Musical Mind of Dana Countryman follows in the infectious spirit of the equally wonderful Pop! The Incredible Fantastic Retro Pop World of Dana Countryman in its celebration of the great, hooky songs of days gone by–except Countryman doesn’t do covers. His songs are all original, picks to click, and rising up the charts with a bullet traveling at the speed of sound (well, in a perfect world, anyway!). Adept at all manner of instrumentation and possessing a golden set of musical pipes, Countryman lays his cards out on the CD player: He’s here to celebrate the kinds of songs they just don’t write and record anymore. His influences, from Gilbert O’Sullivan and Eric Carmen to the Beatles and beyond, are worn on his sleeves and bathed in his own, unique approach to songwriting and production. You can see, on the back of the CD, a sly depiction of Countryman’s “workbench,” with 45s by O’Sullivan and Carmen, and one by the Beatles sporting the warmly-nostalgic old Capitol Records orange and yellow swirl label, in plain view. Also on this “workbench” is a tin of Carpenters gunpowder of the “finest quality.” Seems about right. Pop 2’s “explosive ingredients” are also listed on the back cover–a dozen songs from the album proper and a pair of bonus tracks. These are the upbeat elements of one of the most addictive albums of 2014. Songs like the dynamic opener, “Baby, I’ll be Your Star,” which comes at you with the speed of a musical locomotive–drums barrel in and a honkin’ hot saxophone takes over–tells the story of a guy who may not come adorned with awards or an entourage but can certainly be “your star.” Containing one of the most seductive middle-eights in memory, this is a heck of a way to open an album. The lovely mid-tempo ballad “The Summer I Turned Seventeen” showcases and mixes peerless pop balladry with doo-wop and Beach Boys vocalizing to tell the story of love lost to time–love that began and blossomed at such a glorious age and was pulled apart when the girl moved away. Wistful and enchanting at the same time, this is a classic waxing–a song for the ages, for all ages, wrapped in a gorgeous and flawless melody. Since I’m a sucker for songs about radio, I was immediately drawn to the joyous and pitch-perfect “Good Radio Day,” which describes the appeal of the soundtrack of summer that used to come out of portable transistor radios back in the day. Sporting a lively Carpenters-styled trumpet part played by one Bill Johnson, the song makes the days of blue skies, warm temperatures and radio’s part in it all come alive. “There’s a lifetime left until September rolls around,” Countryman sings, “so crank it up and everybody party down.” Ah, memories! Dana Countryman is a special kind of wizard, whipping up enticing melodies and producing songs that will stand the test of time whether you’re in a nostalgic mood or looking to the stars in the here and now. Pop 2! is a classic platter that, in some alternate universe, is being spun by two kids sharing their love of music that makes them smile and contributes to the soundtrack of their lives. Connect with Dana Countryman to bathe yourself in all things Pop 2! Click here to be magically transported! This entry was posted in Album Reviews and tagged alan haber, dana countryman, pop 2! 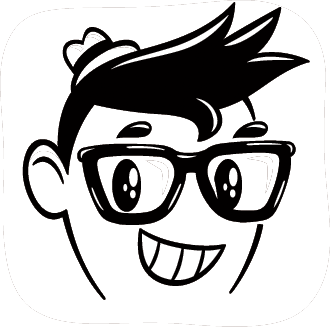 the exploding musical mind of dana countryman, pure pop radio, review, streamlicensing. Bookmark the permalink.